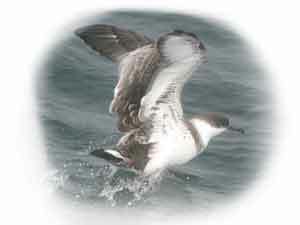 Great and Sooty Shearwaters often dominate the ocean during the second half of summer. Wilson's Storm-petrels can be abundant. Some of the world's biggest colonies of Leach's Storm-petrels also nest along the Maine coast, but their nocturnal habits make them difficult to find. In August, after breeding, they are sometimes seen in daylight from the whale-watch boats, especially off Acadia National Park. Bar Harbor Whale Watch is outstanding for pelagic species during its whale trips. Northern Gannets are frequent sights. Red and Red-necked Phalaropes gather offshore by the thousands later in summer. A few Northern Fulmars are seen, and their numbers increase late in the season. Parasitic and Pomarine Jaegers are regularly seen from whale-watch boats, and a Long-tailed Jaeger is spotted in most years. Great and South Polar Skuas are seen sporadically, and seem to be on the increase. All of the local alcid species are possible, especially in post-breeding dispersal. Currently, the number of boat tours for pelagic birding in Maine is increasing. Maine Audubon offers the largest tour in autumn. Its annual trip on the Bar Harbor Whale Watch boats from Bar Harbor attracts birders from all over the world. In 2007, Maine Audubon began organizing additional trips to Matinicus Rock. Check the Event Schedule at Maine Audubon or call 207-781-2330. Interestingly, Northern Gannets, Black-legged Kittiwakes, Great and Sooty Shearwaters, Razorbills, and Common Murres are often seen from the Grand Manan ferry. The Gulf of Maine is cold - much colder then the Gulf Stream that flows past the state a hundred miles out to sea. These waters produce an abundance of food - more than just the lobsters for which Maine is famous. Whales, sea ducks, and pelagic species flock to Maine for the feast. Humpback, Finback, and Minke Whales are common in the Gulf of Maine. Most of the world's remaining, endangered North Atlantic Right Whales summer off the coast, particularly near Grand Manan. Harbor Porpoises and White-sided Dolphins are often seen in large numbers. 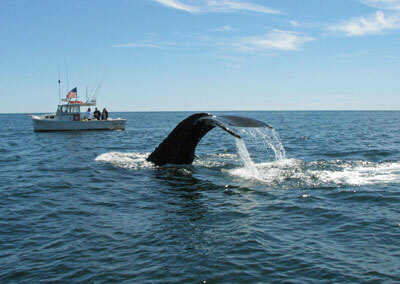 Bar Harbor Whale Watchoperates the largest, fastest whale watch boats in North America. The AtlantiCat and the Friendship V are fast catamarans that cover a lot of ocean in a hurry, yet are big enough to be stable in rough weather. The morning trips skirt the coast of Acadia National Park on the way out to sea, then surge across the bay to Petit Manan Island for a close-up of Atlantic Puffins, Razorbills, and its breeding colonies of Common, Arctic, and Roseate Terns, before continuing the search for whales. Afternoon trips go straight to the whaling grounds. These waters are particularly fruitful for pelagic bird species, such as the Great Shearwater. Robertson Sea Tours in Milbridge gets visitors very close to the whales. The 28-foot Kandi Leigh and the 33-foot Susan Jane accommodate only six passengers, putting you close enough to the water to go eye-to-eye with whales and seabirds. Call 207-483-6110. The Odyssey of Portland has several impressive things going for it. First, it is located in Maine's largest city. Second, its moderate price covers more boat time than most, because it takes longer to reach the best whale-watching seascape. For an enthusiastic birder, time at sea is everything. The Odyssey boasts a nearly 100% sighting record on Jeffrey's ledge and the Sagadahoc Grounds. Captain Fish's originated whale-watching around Boothbay Harbor and is now in its third generation of family operation. Yet, despite its long history, its vessels are among the most modern and	well-equipped. Besides the whale-watching trips, the company provides several other excursions of particular interest to birders, especially the Wednesday trips to Eastern Egg Rock for Atlantic Puffins. Eastport Windjammersin Eastport features the vessel Pier Pressure, which sails out to the feeding grounds of Humpback, Fin and Minke Whales just beyond East Quoddy Lighthouse. In later summer, expect to sail through thousands of Bonaparte's Gulls, Black-legged Kittiwakes, and rafts of seabirds feeding on the same abundance that attracts the whales.